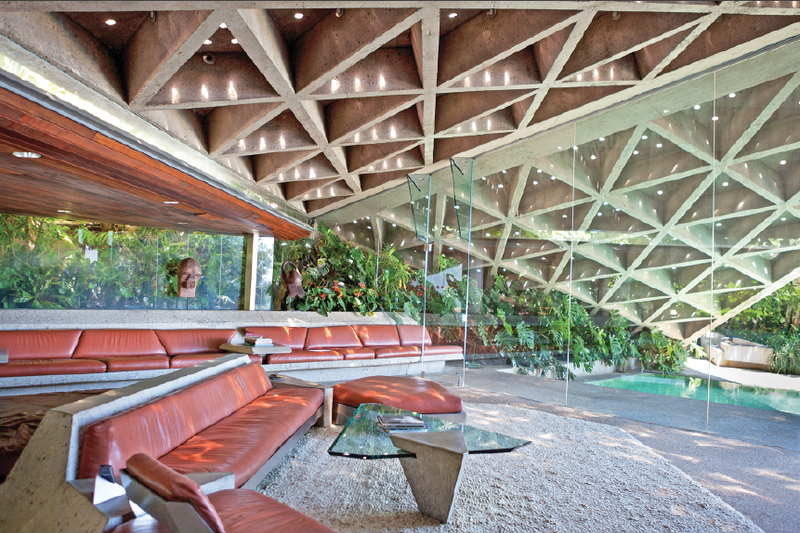 Film culture has long had an obsession with the architecture of John Lautner, a protégé of Frank Lloyd Wright. One should not move to Los Angeles ambivalent about living in a near-perpetual state of revision. I’ve lived in the city for eight years, enough time to love it deeply, and in adopting the Angeleno constitution I’ve come to embrace an abiding concern with appearances. I don’t mean this in a derogatory way, that the city is superficial. But Los Angeles—with its sylvan, scruffy hills of shrubs and chaparral, its flexibly employed subcultures, the mishmash of mini-cities and architectural styles resting comfortably above fault lines—is both a city to watch and a city that watches you back as you traverse it. The mountains and valleys draw you in, the topographic secrets and security gates keep you hunting—especially if you have a taste for architecture (and you will build one here if you don’t). Soon enough you find yourself methodically exploring the sprawl in search of what’s deemed architecturally significant, making a personal study of each home’s provenance along the way: So-and-so owns this one; Movie A was made there; a Manson-family murder happened around the corner; this space-age thing could house the Jetsons. When I first moved to Los Angeles, I found myself energized by the city’s aesthetic extremes and, upon watching Brian de Palma’s Body Double, quickly sought out John Lautner’s Chemosphere house, arguably the film’s most pivotal character: an octagonal pod-like home with a 360° view, thrust above the hills on a single pole plunged deep into a steep, sloping lot. The film cannot happen without the presence of this house: Once sensationally referred to as an “Earthbound UFO” in the defunct Los Angeles Times Valley News, the home is accessed via funicular, and serves as a unique vantage from which to witness a murder staged against the rustic canyon landscape of the Hollywood Hills—an ideal setting for a primitive act despite what seems like peaceful, bucolic surroundings. For a New Yorker who grew up in apartments embedded in flat land and, later, in a suburban split-level, the Chemosphere was the most dramatic move an architect could make. I stalked its exterior frequently, puzzled over how it was built, how it stayed there, having survived earthquakes and mudslides that had taken out houses nearby. When friends would visit, I’d drive them up the treacherous turns of Mullholland Drive that literally provide a border between the San Fernando Valley to the north and the city to the south. I’d turn onto a dead-end side street near a scenic outlook that shows off the Valley and the NBCUniversal Tower in front of the Burbank foothills. Then I’d turn around and drive past the house, coming at it from the north, to give them the best view. The image of living in the neon-mirroring Los Angeles night sky was intoxicating. What would I see from inside? I didn’t know the home’s resident or owner, had not yet seen all the movies and tv shows that made use of it, but I was hooked, and would seek them out the same way Angelenos sit through mediocre flicks just to catch a glimpse of an industry friend doing his or her thing. Meanwhile, I’d taken up residence on the east side of the city, which, as any architecture fetishist knows, is a hotbed of mid-century design innovation, in a neighborhood called Los Feliz, just below a Frank Lloyd Wright house (the Ennis, used most famously in Blade Runner) and just a few minutes’ jog from Richard Neutra’s Lovell Health House (the home of L.A. Confidential’s villain pornographer). I immediately sought out other Neutra homes, as well as Lautner’s Silvertop House in the bordering neighborhood, Silver Lake, which could only be viewed from across a reservoir. I found it astounding that all I needed was a car to see these structures. I bought a good camera, went on solo photography expeditions, pored over coffee-table books that displayed photos by mid-century architecture’s best visual chronicler, Julius Shulman, who took the first pictures of the Chemosphere house and had worked for Neutra. I felt a pervasive sense of pioneering, though I was just seeking design, as opposed to embarking on death-defying physical adventures set in the wild. Here the land itself staged art, influenced it—an outdoor, living museum. I’d become an architecture fan through Los Angeles’s great modern houses. Movies had sparked the divertissement. Lautner homes—fluid, organic playgrounds for space and light, set in the elements—have been used in over a dozen movies, often as the homes of solitary men, most of them ne’er-do-wells. The list of homes as film stars includes but is not limited to: the Elrod House in Palm Springs (fight scene, Diamonds Are Forever, Sean Connery vs. scantily clad Bond Girls in a roundtop room with a view of the Coachella Valley desert); the Garcia House, which literally looks like a glass eye built into the Hollywood Hills (and whose replica was dragged off a cliff by Mel Gibson in Lethal Weapon 2); the Jacobsen House, a hexagonal, steel-framed backdrop for a shootout between Paul Newman and James Garner in the 1998 crime mystery Twilight. Other Lautner homes have framed less sinister characters, certainly less violent scenes, but still offer asylum to the eremitic: the elegant, glass-and-redwood Schaffer House, a clean refuge among live oaks for a despondent professor in Tom Ford’s A Single Man; andSilvertop, a curvilinear glass-and-conrete-forward space used as the home for a lost college graduate facing a dehumanizing adulthood in the adaptation of Bret Easton Ellis’s Less Than Zero. Of them all, the Chemosphere has made the most appearances in films and television—including Charlie’s Angels and even The Simpsons. Perhaps fittingly, it is owned by Benedikt Taschen, the German publisher of oversized art, erotica, architecture, and photography monographs, a man who has popularized design for the mainstream, turned what was once the coffee-table book into a collectible artifact itself. 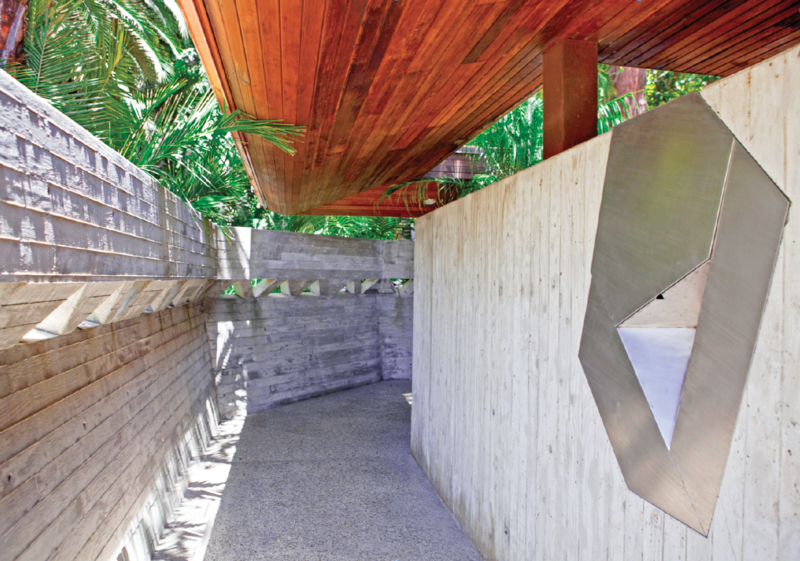 Whether it’s the sculptural concrete, the walls of glass, or the surprising angles of steel and wood, the elements of Lautner’s homes appeal immediately to the human spirit. Lautner created spaces that invite us to be (or at least think) primal inside them, and therefore, in some sense, to act free, even play. His homes represent an independent, less systematic approach to modernism—honoring modernism more intrinsically than the homes of his forebears by following the contours of the earth as opposed to the linear blueprints of the more strict International Style. 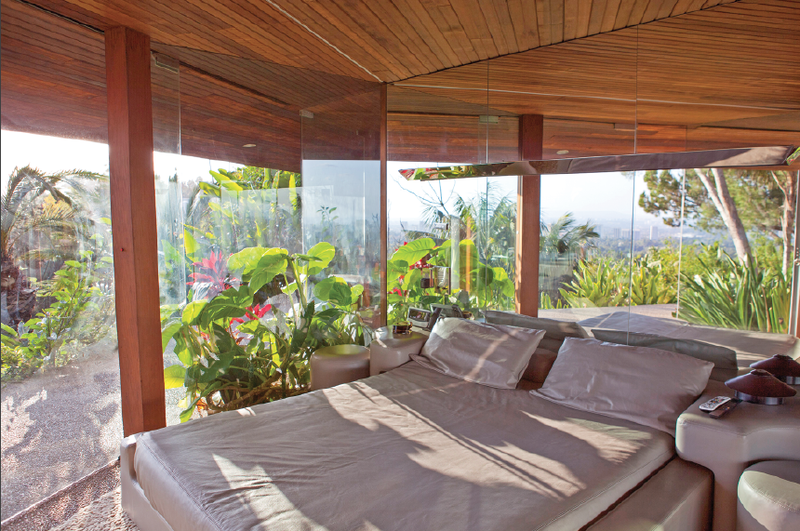 Lautner’s homes are not attempts at luxury. They are, at the core, art projects, and they were produced for remarkably humble sums (about $2,000 in 1960 to design and oversee the construction of the Chemosphere; about $4,000 in 1968 for the Elrod House). Despite their use in film, they evoke nothing nefarious; if anything, they project an exuberance for life, a dialogue with nature. Quite simply, they encourage imagination. (That Lautner was a jazz enthusiast makes sense: Many of his houses sculpt concrete as well as air, the way Miles Davis, say, used sound as well as silence.) Early in his career, Lautner had faced harsh criticism from the East Coast architectural establishment for his commercial work—restaurants and gas stations, for example, that used large, geometric (or “atomic”) shapes for signage. He resented, too, that the Chemosphere was often referred to as a “flying saucer.” For Lautner, its form was function, built with specific needs of the client in mind (in this case, an aerospace engineer and his family), and the architect was flexible about how his structures could be used, customized, or improved. Only later, through the press and film, did the Chemosphere become associated with mystery, the pernicious, sci-fi. In many ways, it is the most generous structure in Los Angeles, offering an unadulterated view of the world. 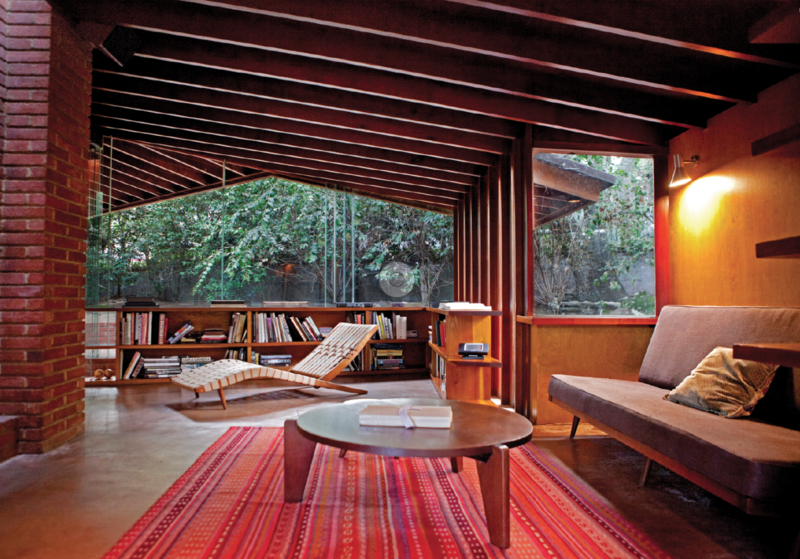 It’s difficult to see a Lautner house, and more so, one from its interior. Some, like the Sheats–Goldstein, are hidden; most are occupied or managed by owners or their staff. In 2011, a few high-priced tours were given to celebrate Lautner’s hundredth birthday, and there are occasional chances to step inside one of these spaces, but they are rare. And yet Lautner’s popularity only seems to have intensified in recent years—through architecture-fan blogs and real-estate websites such as Curbed LA; museum exhibitions; the opening of the Hotel Lautner in Desert Hot Springs, California; a documentary that explores his greatest work, called Infinite Space; and, among other coffee-table books, a lush compendium published by Taschen himself. 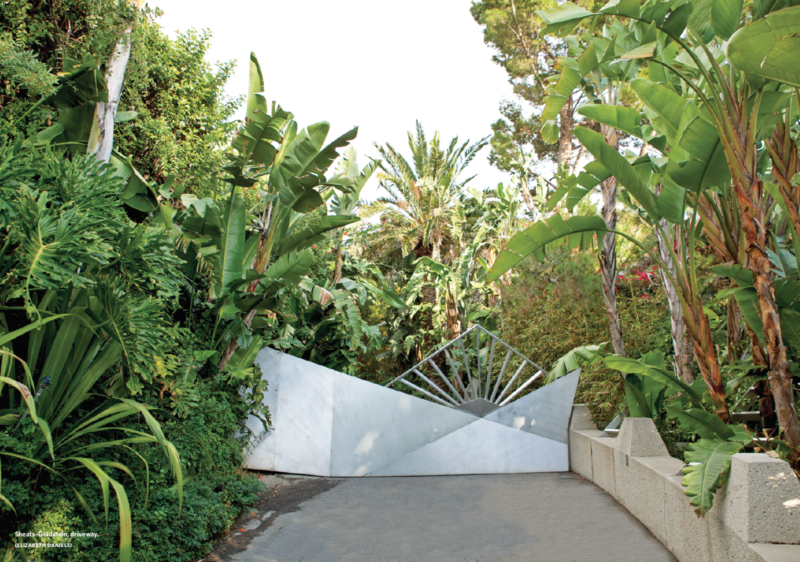 For its part, the Sheats–Goldstein House, concealed just beyond one of the winding roads of Benedict Canyon, appears from the street to be just a number on a curb between two actual houses. Its driveway descends crookedly, as if to throw off any visitors toward the neighbor’s house. But once you find your way down to the motel-sized carpark, it’s clear you’ve landed upon one of L.A.’s residential gems, built into the side of a cliff overlooking the city and its vaporous sky. I’d gotten lucky, with permission to tour the home through an architect’s connection to the owner. I arrived early to meet with Rick Heinrichs, the production designer of the belovedly entropic Coen Brothers film The Big Lebowski, which used Sheats–Goldstein to stage a comic bad-guy scene that was itself a send-up of bad-guy scenes. In Lebowski, The Dude, a perpetually relaxed do-nothing victim of mistaken identity, played by Jeff Bridges, is thrown into a crime-noir mix-up, captured by goons, and delivered to the home—this home—of a slick pornographer named Jackie Treehorn. (The scene ends when Treehorn drugs The Dude, such that he falls, face-first, onto a coffee table before drifting into a Busby Berkeley–style dream sequence). In the carpark, I ran into an ebullient blond woman of about fifty, who emerged from a sharp Mercedes coupe. She introduced herself as the owner’s assistant, then invited me into the home of her employer: Jim Goldstein, a flamboyant Los Angeles social fixture and generous multimillionaire known for his devotion to modern architecture, to Lautner specifically, and to being an NBA superfan. 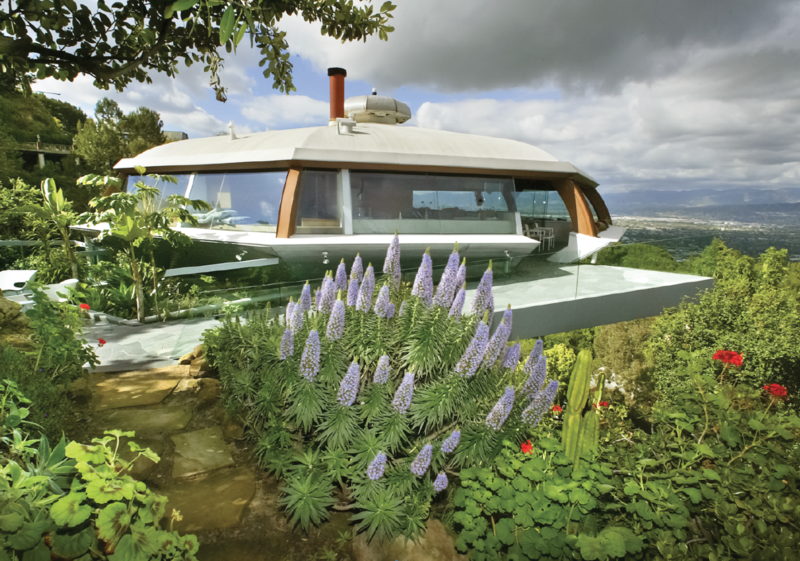 (Lautner homeowners are, in fact, a subculture of their own, including, among Goldstein, a DreamWorks executive and an esteemed screenwriter.) Walking into the foyer, I stepped across glass slabs that seemed to float like the koi in the pond below, then into a vaulted, concrete-ceilinged living room that oozes past frameless glass windows toward an uncovered pool-centered patio that juts a triangular corner, sans protective fencing, out toward the skyline of Century City. 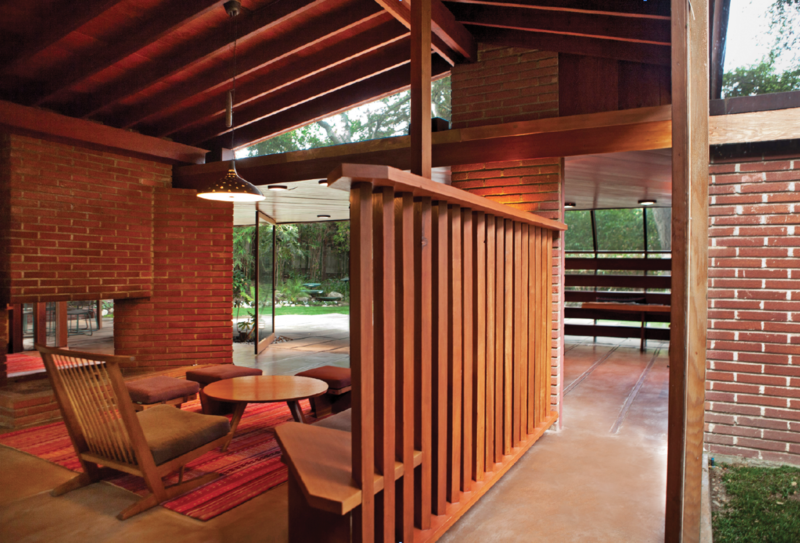 In real life, this house—built in the 1960s, replete with drinking glasses punched into the roof to shoot beams of Los Angeles–branded light into the space, what Lautner called the “perforated light in a primeval forest”—was commissioned of the architect for a family with children (the Sheatses). Goldstein bought the home in 1972, and enlisted Lautner to help him transform it into the strikingly groovy pad it is today, including a swimming pool renovation that moved the water level up to the edge of the terrace, a precursor to the contemporary infinity pool. Come dusk, the pool mirrors the tent-shaped roof and the stars above. Heinrichs arrived trailing a group of German tourists, young men dressed in tight, color-saturated, neo-preppy clothes and fedoras. They spoke quickly to each other, with utter delight on their faces, and sported heavy, expensive cameras with massive zoom lenses—perhaps the optimistic spawn of Lebowski’s gang of criminal nihilists? Walking through the living room, Heinrichs, a man with graying hair and observant blue eyes, seemed quite taken with the details and view. “It’s a playfully serious place,” he said, “and it was perfect for our scene. We hardly had to do anything to it.” He was deferential to the Coens, and to Ken Adam, the veteran production designer who’d used Lautner’s Elrod house for Diamonds Are Forever. This was the first time he’d been back to the site since the Lebowski shoot. He pointed out toward the sky at the edge of the terrace. “In the movie, this is supposed to be Malibu,” he said. “But ours was a night shoot.” We talked about how Los Angeles is for so many people anything they want it to be. I asked him if knowing that the space was real as opposed to a set on a soundstage influenced the performances, and he grinned. I was beginning to sound geeky. As we spoke, the Germans trounced about the place—popping up from behind staircases, laughing excitedly as they posed near the credenza that served as the bar in Lebowski. “How did they get in here?” he asked, then shrugged and walked around the low-slung, built-in couches. The pool began to gurgle, belch, and Heinrichs and I shared a laugh. At that moment the Germans appeared by the pool and asked me to take their picture. Heinrichs smiled and waited. “This place is a magical wonderland!” said one of the Germans, who soon thereafter began to shoot pictures of pictures of the house that hung on a wall, opposite what looked to be Michael Jackson’s jacket from the “Beat It” video. Another German ran around the side of the pool to find the Jacuzzi. “It’s like a dream here!” he said. The idea of manipulating people through imagery is what drives De Palma’s narrative for Body Double, in which the Chemosphere functions as an inhabitable lens, the most interesting way to use a Lautner home in film. The bad guy is the home’s “house sitter,” and to make good criminal use of the place he presents to a voyeuristic patsy, via telescope, the staged murder of his wife in another house located across a canyon. The film’s a pulpy cocktail of Rear Window and Vertigo references—the unwitting protagonist is a claustrophobic actor who has trouble playing a B-movie vampire confined to a coffin—but there’s a powerful visual vocabulary at work here; the use of the home is a comment on film, the most modern of popular art forms that requires frames through which to see narratives unfold. In Tom Ford’s A Single Man, Lautner’s Schaffer house, a much more proletarian home than his later projects, serves as a sanctuary in nature for a suicidal academic, played by Colin Firth, who shuts himself off from others as he grieves the loss of his male partner, at a time when it felt terribly isolating to be gay. 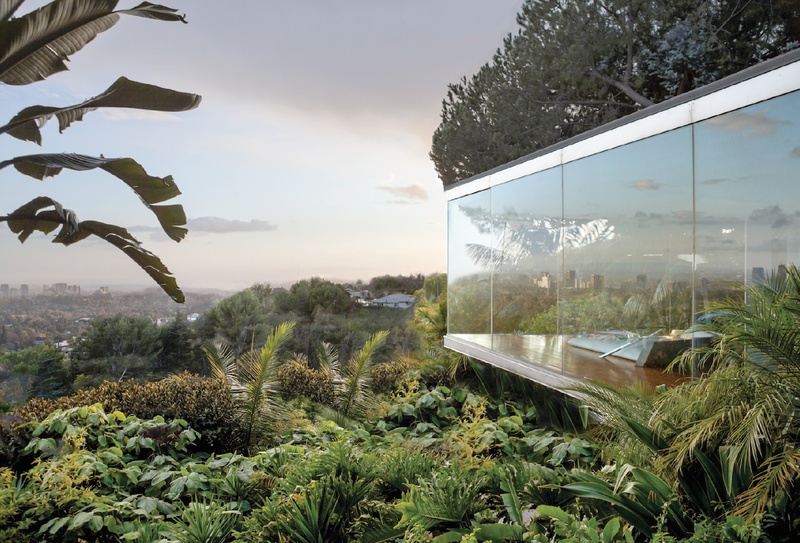 But in his unpretentious redwood house, with glass that lets him be one with the surrounding flora, he possesses a complete, private part of the world just for him. “He probably would have loved the way this house was used in that film,” said Escher. Lautner built the home on the very site where the commissioning family would take picnics, keeping nearly every shading tree in place. There is a human, touching parallel here, in the way Ford’s film provides a nook in nature for his protagonist. Architects constrained by style manifestos are no different than composers who only write in twelve-tone rows. But the world doesn’t work that way, and neither do Lautner homes, which sometimes even introduce nature into living space, whether it’s rocks, leaves, dirt, sand, air. Lautner’s work is humbling, the way the whole of nature makes you feel small. It contextualizes the sublime, and like powerful Pacific waves or Coachella Valley desert rocks reminds you how minuscule you are—like every other animal. That filmmakers used them to stage the homes of wrongdoers or sociopaths who exercise the animalistic part of themselves is just one expression of the honesty that these homes beg us to acknowledge, and as much as people might believe Lautner’s work is misunderstood by filmmakers, it is not. These characters are often set alone in these spaces—alone to consider their tiny places in the universe—and that they often crave control could be the filmmaker’s last laugh, a sign that they comprehend the big ideas posited by Lautner’s architecture. The movie character may think that he’s living large, but in fact he’s a microbe in the larger sphere (perhaps more comfortable among the stars and trees than other among humans), and that’s one of the things that a Lautner space is about: inviting man to consider scale. Lautner once told the writer of a 1986 UCLA oral history that of all the major cities’ populations, Angelenos are the least interested in architecture. “[The city’s] just built on advertising,” he said. “And it has been affected by the movie industry: the stage set. And they’re used to the facade, and it’s perfectly all right. And, the climate permits it and so on, so there’s nothing real, nothing solid, and nobody cares.” It would be eye-opening to see his reaction to many of Los Angeles’s new architecture fanatics as they queue up for modern home tours in southern California, talking about film sets and the directors who made these homes notable to them. In films, these homes’ characters may seem malignant, or to live on the edge of what we consider normal, but that’s why the homes are ideal sets for literal contrivance. They are micro worlds, open to space, with simultaneous access to the wild and shelter from it. And that many of his most famous homes used in film are located in or near Los Angeles speaks to our rightly equating the city with the perpetual stretching of the American imagination. Just as we want to venture into this city of possibility, frolic about its canyons, there’s an urge to climb into these movies, visit the houses used in them. 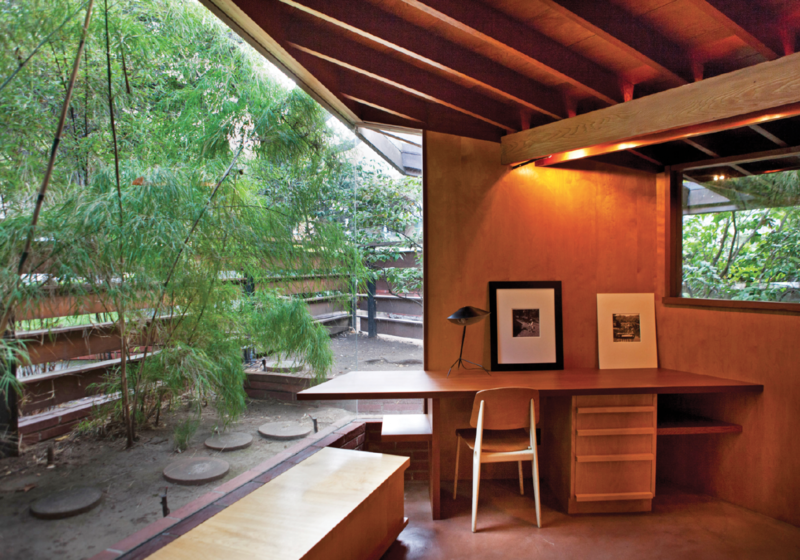 Lautner’s nature-infused houses let these films do more than tell us stories. They allow us to play inside the narratives—to redesign them, write, if only in our minds. Adam Baer lives in Los Angeles. A former NPR cultural producer and Travel + Leisure correspondent, he has worked as a music critic for the Los Angeles Times, and has written essays for Harper’s Magazine, the New York Times, NPR, and anthologies such as Before & After: Stories from New York (Mister Beller’s Neighborhood, 2002). Elizabeth Daniels is a photographer based in her native Los Angeles. She has worked for Curbed, Eater, and Racked LA for three years, and her photographs have been used by Rolling Stone, Bon Appetit, GQ, and Elle magazine. Previously, she curated Michael G. Wilson’s photography collection and worked at the Getty Museum. Beautiful and fascinating piece. Googled this through "Los Angeles Plays Itself". I hope Los Angeles keeps it's unique architecture. LA Modern, vernacular architecture.... I also wish the Los Angeles Basin was stuck filled with villages but alas the car. Great piece.